For other uses, see Portrait (disambiguation). A Roman-era bust of Athenian General Themistocles, based on a Greek original, in the Museo Archeologico Ostiense, Ostia, Rome, Italy. The lost original of this bust, dated circa 470 BCE, has been described as "the first true portrait of an individual European". Most early representations that are clearly intended to show an individual are of rulers, and tend to follow idealizing artistic conventions, rather than the individual features of the subject's body, though when there is no other evidence as to the ruler's appearance the degree of idealization can be hard to assess. Nonetheless, many subjects, such as Akhenaten and some other Egyptian pharaohs, can be recognised by their distinctive features. The 28 surviving rather small statues of Gudea, ruler of Lagash in Sumeria between c. 2144–2124 BC, show a consistent appearance with some individuality. Some of the earliest surviving painted portraits of people who were not rulers are the Greco-Roman funeral portraits that survived in the dry climate of Egypt's Fayum district. These are almost the only paintings from the classical world that have survived, apart from frescos, though many sculptures and portraits on coins have fared better. Although the appearance of the figures differs considerably, they are considerably idealized, and all show relatively young people, making it uncertain whether they were painted from life. The art of the portrait flourished in Ancient Greek and especially Roman sculpture, where sitters demanded individualized and realistic portraits, even unflattering ones. During the 4th century, the portrait began to retreat in favor of an idealized symbol of what that person looked like. (Compare the portraits of Roman Emperors Constantine I and Theodosius I at their entries.) In the Europe of the Early Middle Ages representations of individuals are mostly generalized. True portraits of the outward appearance of individuals re-emerged in the late Middle Ages, in tomb monuments, donor portraits, miniatures in illuminated manuscripts and then panel paintings. Moche culture of Peru was one of the few ancient civilizations which produced portraits. These works accurately represent anatomical features in great detail. The individuals portrayed would have been recognizable without the need for other symbols or a written reference to their names. The individuals portrayed were members of the ruling elite, priests, warriors and even distinguished artisans. They were represented during several stages of their lives. The faces of gods were also depicted. To date, no portraits of women have been found. There is particular emphasis on the representation of the details of headdresses, hairstyles, body adornment and face painting. One of the best-known portraits in the Western world is Leonardo da Vinci's painting titled Mona Lisa, which is a painting of Lisa del Giocondo. What has been claimed as the world's oldest known portrait was found in 2006 in the Vilhonneur grotto near Angoulême and is thought to be 27,000 years old. When the artist creates a portrait of him- or herself, it is called a self-portrait. Identifiable examples become numerous in the late Middle Ages. But if the definition is extended, the first was by the Egyptian Pharaoh Akhenaten's sculptor Bak, who carved a representation of himself and his wife Taheri c. 1365 BC. However, it seems likely that self-portraits go back to the cave paintings, the earliest representational art, and literature records several classical examples that are now lost. 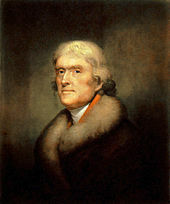 Rembrandt Peale, Portrait of Thomas Jefferson, 1805. New-York Historical Society. The official portrait is a photographic production of record and dissemination of important personalities, notably kings, presidents and governors. It is usually decorated with official colors and symbols such as flag, presidential stripes and coat of arms of countries, states or municipalities. There is also connotation as an image of events, products and meetings. Portrait photography is a popular commercial industry all over the world. Many people enjoy having professionally made family portraits to hang in their homes, or special portraits to commemorate certain events, such as graduations or weddings. Since the dawn of photography, people have made portraits. The popularity of the daguerreotype in the middle of the 19th century was due in large part to the demand for inexpensive portraiture. Studios sprang up in cities around the world, some cranking out more than 500 plates a day. The style of these early works reflected the technical challenges associated with 30-second exposure times and the painterly aesthetic of the time. Subjects were generally seated against plain backgrounds and lit with the soft light of an overhead window and whatever else could be reflected with mirrors. As photographic techniques developed, an intrepid group of photographers took their talents out of the studio and onto battlefields, across oceans and into remote wilderness. William Shew's Daguerreotype Saloon, Roger Fenton's Photographic Van and Mathew Brady's What-is-it? wagon set the standards for making portraits and other photographs in the field. In politics, portraits of the leader are often used as a symbol of the state. In most countries it is common protocol for a portrait of the head of state to appear in important government buildings. Excessive use of a leader's portrait, such as that done of Joseph Stalin, Adolf Hitler, or Mao Zedong, can be indicative of a personality cult. In literature the term portrait refers to a written description or analysis of a person or thing. A written portrait often gives deep insight, and offers an analysis that goes far beyond the superficial. For example, American author Patricia Cornwell wrote a best-selling book entitled Portrait of a Killer about the personality, background, and possible motivations of Jack the Ripper, as well as the media coverage of his murders, and the subsequent police investigation of his crimes. ^ a b CAHN, HERBERT A.; GERIN, DOMINIQUE (1988). "Themistocles at Magnesia". The Numismatic Chronicle (1966-). 148: 20 & Plate 3. JSTOR 42668124. ^ Donnan, Christopher B. Moche Portraits from Ancient Peru University of Texas Press, 2004. ISBN 0-292-71622-2. ^ Jones, Jonathan (6 June 2006). "Old masters". The Guardian. London. ^ Sage, Adam (5 June 2006). "Cave face 'the oldest portrait on record'". London: The Times. Archived from the original on July 24, 2008. Retrieved 2008-01-04. Look up portrait in Wiktionary, the free dictionary. Look up portraiture in Wiktionary, the free dictionary. Look up portraitist in Wiktionary, the free dictionary. 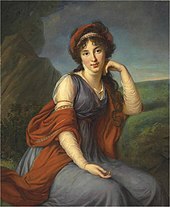 Wikimedia Commons has media related to Portrait. Wikimedia Commons has media related to Selfportraits. Jeanne Ivy's Self-Portrait Page - What Artists Find When They Search in the Mirror. Portrait Detectives - Fun interactive introduction to the analysis of portraiture. Reportret - A gallery of reconstructions of missing portraits from world history.